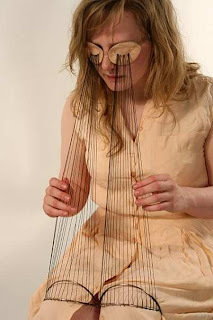 I went to the degree show at Camberwell College of Arts yesterday and was struck by Georgia Rodger's video piece Blinkers Instrument, with its image of a woman plucking at a harp-like instrument physically connecting her eyes and her thighs. The artist explains at her website: "In the gendered system of musical instrument classification, string instruments are Apollonian - external, public and masculine. In my contemporary response to this subject instead of the string instrument being representative of the external it is internalised and made bodily (as opposed to being worldly) by the player's elongated eyelashes becoming the plucked strings of the instrument. Compounding my subversion of traditional expectations, the blinkers cut off the player's visual perception of the world and force them to become more aware of the internal world. In respect to gender this feature also forces the aversion of the female player's gaze whilst super feminizing her by the ridiculous extension of her lashes". It put me in mind of Joanna Newsom (right) - well obviously she plays the harp, but also perhaps explores a similar territory of the boundaries between private introspection and public performance.